Initalize the module and prepare the mesh for decimation. Return value of max. allowed error. 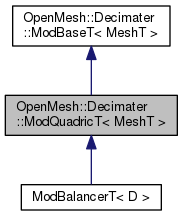 Mesh decimation module computing collapse priority based on error quadrics. This module can be used as a binary and non-binary module. Compute collapse priority based on error quadrics. Set maximum quadric error constraint and enable binary mode. _binary Let the module work in non-binary mode in spite of the enabled constraint. Unset maximum quadric error constraint and restore non-binary mode.